John Wilkes Booth escaped after assassinating Lincoln and spent his last 25 years living comfortably in Forestville. Believe it or …no, don’t believe it. Not a chance it’s true. But many locals were convinced he really was hiding there and were eager to shield him. The tale of Thomas Jerome, the man supposed to be Booth, has more angles than a funhouse mirror. A superficial writer could look at the funny side of it all, as if today the denizens of a trailer park convinced themselves an elderly newcomer was actually Elvis. Or it could be viewed as an interesting 150 year-old conspiracy theory which won’t go away – the History Channel and other cable shows have produced sensationalized “Booth Escaped” programs in recent years. But peer deeper at the story and it reveals how strongly our ancestors clung to every awfulness the Confederacy represented, even decades after the Civil War. And that side of the story is a revealing insight which doesn’t appear in our Sonoma county history books. Historians point out that Forrester’s book is filled with errors and misconceptions regarding the assassination and the Booth family, but what interests us in Sonoma county is her section about a Booth look-alike who had lived in Forestville. This part of her book is mostly oral history, as she is not straining to prove Thomas Jerome fits into her elaborate conspiracy theory. The majority of mistakes there are probably due to the faulty memories of her interviewees who were recalling a man who had died some forty years earlier. Here she mainly interviewed Elisha Shortridge who was close to 90 at the time, living in a log cabin somewhere deep in the redwoods outside Forestville. He was a fascinating character; he had a Zelig-like quality to pop up at some of the most interesting local events in the 1880s and 1890s. I’ll certainly be writing about him again, and soon; watch for the story of the Wirt Travis murder. As mentioned earlier, the flaw in Izola Forrester’s book was that her historical research skills were weak. Had she done a little digging, there was more to learn about Tom Jerome. He was supposedly about the same age as Booth, although we can’t be sure – I can find nothing about him before he appeared in California in 1868, working as a photographer in Eureka. He claimed variously to be from Alabama or Virginia. He was still a photographer when he appeared in Sonoma county in 1870 living near the Russian River, but by the next year he stated he was an artist. This is how he identified himself in the voter rolls for the next 17 years, changing his occupation more specifically to painter in 1888. He was described as being 5′ 9″ tall, dark complexion with dark eyes and “arms both crooked”, whatever that meant. In a nutshell then, here is the recipe for a John Wilkes Booth: Take one (1) Southerner with dark hair born in the mid-1830s, stir in enough education to be well-spoken and enough vanity to be well dressed, add a dollop of mystery (dark past preferred) and mix well. Serve in any community still hot over the Confederate cause and where people thought it was cool to harbor the man who might have killed Lincoln. And in 1870 California, Santa Rosa and its surrounding region was just such a place. “There wasn’t anyone who’d ever have given him away up here,” Elisha Shortridge said. Forrester asked if he was referring to the Knights of the Golden Circle, the most prominent of the Confederate secret societies which were the direct ancestors of the Ku Klux Klan. In California during the Civil War the group encouraged sedition, including training militia groups that went to fight for the South in the Civil War. The KGC’s propaganda efforts undermined Union support in the West (Santa Rosa’s weekly Sonoma Democrat was long rumored to be financed by KGC backers) and was involved in an attempt to split off Southern California into a separate, slave-holding state. Immediately after Lincoln’s assassination it was presumed the KGC was behind it, and that John Wilkes Booth and his co-conspirators were part of it. The Jeromes had two children; the older daughter apparently didn’t want to talk about her father but her younger sister remembered him as austere and mysterious. She said he had been an actor, knew Booth when both were young and had “doubled” for him, but would not say exactly what that meant. She also mentioned the Confederate Secret Service, which suggests some (or all) of what she knew spilled out from the echo chamber. However swashbuckling his past, his life in Sonoma county came to center upon relationships with the Myers family in Windsor and the Clarkes of Forestville. He married Ida Myers in 1874, and a year later daughter Frances was born. The second girl, Edith, came along in 1880, the same year Ida died of TB. After that the Myers raised their grandchild Frances and Edith was sent to live with the Clarke family. 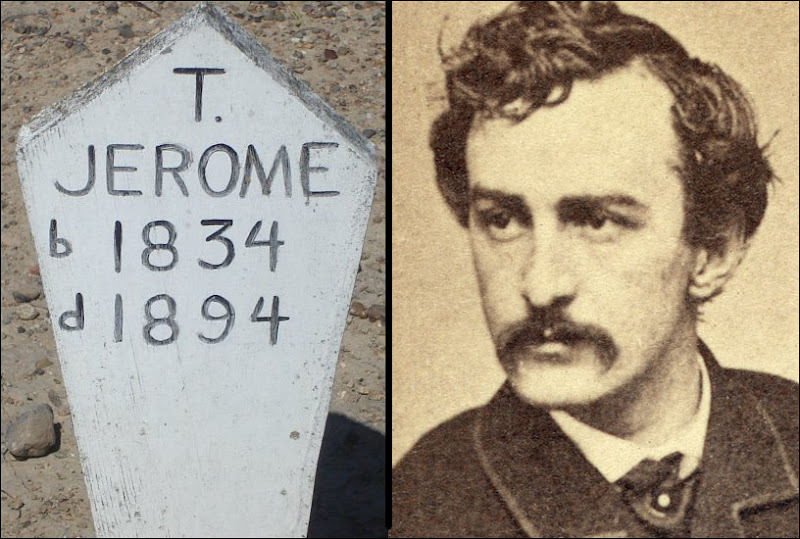 Thomas Jerome’s death is as vague as his origin. Although he supposedly died at the Clarke home there is no Sonoma county death certificate for him, nor any newspaper obituary that can be found. The cemetery records list only that he died sometime in November 1894. Izola Forrester believed she solved the puzzle after daughter Frances gave her the address of cousins in Philadelphia. Forrester contacted them and was told that yes, their uncle Thomas McGittigan was a Confederate sympathizer and believed to have gone to California, where he disappeared. But either the Philly cousins were out of touch with their own family or Forrester misunderstood what she was told. There was indeed a McGittigan generally matching the profile but he was an Irish immigrant who became a Union soldier, then spent the rest of his life around Philadelphia. A photo of McGittigan as a youth convinced Forrester he was neither Booth nor Jerome. As the Myers family came from Pennsylvania, perhaps Izola was confused by something Frances said concerning the other side of her family tree. Frances Jerome’s family remained here and flourished; there are now great-great-great and 4-g grandchildren in West county, but the family only knows about the Booth story through Forrester’s retelling. That probably isn’t surprising, as Frances said “it would kill me” if it were proven she was the child of John Wilkes Booth, so it wasn’t a story she herself would have passed down. To some people, treason and murder are not points of pride. Imagine that.